No Short Corners: How does one say "Hmmmveeeryinnnnteresting." in Portuguese? How does one say "Hmmmveeeryinnnnteresting." in Portuguese? 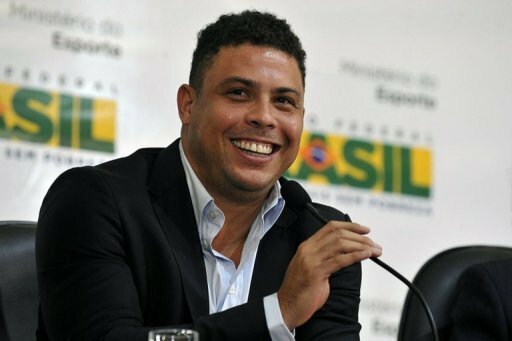 I have been fighting to not fall under the weather the last couple days, and one of the first things I saw after awaking essentially victorious this morning was that Ronaldo (yup, that one) has joined the ownership team of the NASL's Ft. Lauderdale Striukers. Surely, this will tickle NSC pal Phil Schoen to no end. In fact, I would rate this as probably much more interesting than Raul signing a player-to-technical director deal with the Cosmos. This may be pure "seems right" supposition from me, but suddenly there are growing forces in what could turn into a promotion-relegation debate from below the until-now non-existent happy line. For the down side of pro/rel you only need to look at the middlesboro v derby co game today at the riverside. This was a battle of two of the top three teams in the English second tier and it was played before a better than half empty stadium. MLS playoffs are just starting to find a niche and the level of play is getting better every season. More teams is going to make MLS even more exciting. We have a good thing here with this MLS Cup playoff format. Mentioning one game is not much of a point, and one that can easily be flipped on you. That being said, who says adopting pro/rel would mean the end of the playoffs? I'm sure if middlesboro and derby meet in the championship playoffs, the riverside will be packed. Pro/rel is based on a balanced schedule, so theoretically, there is less of a need for a playoffs. And a balanced schedule in a country the size of the USA is not easy, especially for the teams on the coasts. I think in theory, most people like the idea of this system, but for practical purposes, it is questionable. Certainly any MLS team with an academy and a USL affiliation is going to be ahead of the curve. We're looking for some minority owners for our NASL team in Atlanta. Any takers? Greg, reach out to some of your retiring contacts. the reason pro/rel has not happened is that MLS owners run MLS and MLS owners do not want their teams at risk of relegation. dany, can you blame an owner who has forked over 100 million for not wanting to be relegated, and replaced by a team that bought into NASL or USL for one hundred times less? how about a team that has been in MLS since the start and has helped build the league, and is building a new stadium, they must just face the possibility of relegation now? there is the good side of relegation. river plate was having problems a couple of years ago, and got relegated out of the top division, and they have come back with a vengeance, just winning copa sudamerica. its a nice story, and they beat their bitter rivals along the way, making it extra sweet. i dont blame MLS owners for not wanting pro/rel, but having stagnant leagues hurts american soccer as a whole. the interests of MLS owners are contrary to the interests of american soccer. More money at any level of soccer in the US is a good thing. And a stronger NASL is good for US soccer and the first step to any change to the structure of the pyramid. But NASL is going to need 15-20 really really strong clubs that are spending money that approaches what MLS teams are spending before there is any kind of reckoning. I don't even care about pro/rel (I mean, yeah, it'd be cool, but I don't share the strong opinions of people like Dany here), but it'd be pretty great to see a healthy NASL picking off a handful of college prospects every year and luring decent international signings. That would either force MLS to up their spending or force the hand of the USSF. But it's going to take more than the Cosmos and whatever il Fenomeno brings to raise NASL to that level. That's the thing I don't understand about the current element of pro "pro/rel". There is no strong 2nd division so why on earth would USSF do anything. because adding the incentive of promotion brings money to NASL. the argument on my side is that NASL is only so weak because of the stagnant pyramid. Dany, I'm really not sure why you would call a league stagnant, when it's got two new teams coming in, and that translates to about 50 more players getting top level experience, in the US. MLS owners understand that to maximize their profits, they need to field a top product. And any time an MLS team plays cosmos, they need to make sure to beat them down extra hard. The cosmos set soccer back in America by at least twenty years, and that was ashame. Danny, that's a great point, the new cosmos might be even worse. They have people like Eric cantana and jenn Ching in their front office. cantona hasnt been with the cosmos for two years. not sure who "jenn ching" is. Are you arguing against stagnation, or a growing federation here dany? both. pro/rel means more money for lower divisions which means more total professional academies which means a wider net to catch more talent. Dany, do you think the Dutch catch talent with their nets spread wide and far around the country, or do they cultivate talent? Maybe both? People getting caught up on pro/rel, maybe they are missing something. Dany you are a Marxist/ guverist, think about the fact that countries with pro/ rel, the same teams are on top every year, why is that? Money is to be sure, right? What are the odds of Real Madrid being relegated? How about Villarreal? What are their odds of being sent down, compared to real? It surprises me that you are in favor of an institution that is designed to keep the little man down, and you have probably never seen it like that because in the country you come from, and with the team you support, they were probably on top. If you are Dutch, and you live in Amsterdam, and you support Ajax, or wherever you live, if you support Ajax you love promotion relegation. Absolutely love it!!! im not russian, im belarusian. i have no opinions on economic systems, im in this country because a capitalist dictator disappears thousands of belarusians every year. given that almost every dutch national team player started their youth careers at lower divisions, id say pro/rel *is* important. pro/rel is good for big clubs, yes. its also good for national teams. who cares if big clubs thrive and small clubs are weakened. "keep the little guy down" would be a good argument but we're not talking about guys we're talking about football clubs. Merry Christmas ya filthy animals!! !